Going fast is fun… going broke is not. It is no secret that going to the track can run up a heavy tab in a short amount of time. However, if you are going to do something, there is something to be said for doing it right. To that end, Dainese has come to the table with their 2015 Collection and have a new suit aimed at providing superior quality at a price that will not break the bank. The new Dainese Racing Suit allows riders to experience the quality of top-flight Italian moto gear, at a price that makes for a lower barrier to entry. Constructed of Tutu cowhide leather for comfort and abrasion resistance, the CE - Cat. II certification extends to the entire suit. From the composite protectors in the shoulders and elbows, which come standard, to the Pro Shape soft protectors in the hips, riders can open the throttle knowing they are in a suit that was built around protection from the get-go. Additionally, the inclusion of more S1 fabric throughout promises more flexibility so riders can really push through rigorous days on the track with less fatigue. An additional piece in the line is the Dainese Racing Perforated Suit, which can be utilized for the hotter days of the year to allow riders to receive more air flow to the body. This new suit has an improved overall ventilation scheme compared to previous editions. With all of the same functionality and protection as the non-perforated option, this suit is right on the money for those who live in warmer climates or generally tend to run at a higher temperature. 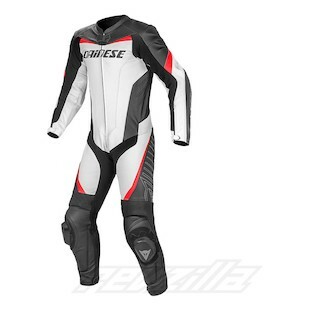 With a price tag under a grand, the Dainese Racing Leather Suit and Dainese Perforated Leather Suit give entry-level riders the opportunity to dive in and test the waters of premium moto manufacturing.